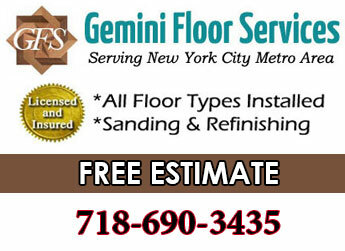 If you’re looking for hardwood flooring Gemini Floor Services is centrally located in Brooklyn and serves the 11235 Brooklyn neighborhoods of Brighton Beach & Manhattan Beach. Named after an ocean resort in England, Brighton Beach started with it’s own beach resort in 1868. There was also an amusement park & boardwalk similar to Coney Island. By 1919 the park burned and was shut down. Shortly after, the subway line was opened and the hotel closed. With convenient subway access the place became more of a popular spot for local city dwellers to make a day trip to the beach . The beach continued to be popular despite ongoing hardships with crime and poverty in the area all the way until the early 90’s. Brighton Beach gradually began improving around then. A large upscale residential development called Oceana was added in the 2000’s. Real estate has been on the rise since. Today it is considered a safe, family friendly beach destination. Brighton Beach has come to be known as Little Odessa with it’s large population of Russian Jews. Many who once fled the Soviet Union settled there. The Russian culture is prominent in the neighborhood businesses & signage. Authentic Russian bakeries, delis, restaurants, night clubs and street vendors are abundant on Brighton Beach Ave. The language, style of dress and overall atmosphere give one a certain sense of being in a different time & place. Some parts can look a little old and gruff, yet overall it’s charming. Old world combines with new in Brighton Beach. Being a popular beach location draws a diverse crowd. Easy subway access brings visitors from all around the city. 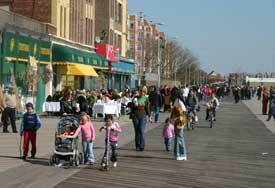 People come to visit Brighton Beach Ave, Coney Island, the beach and the beautiful 2.5 mile boardwalk. The beach on this side is often less crowded than on Coney Island. A relaxing stroll along the boardwalk offers ocean views & people watching. 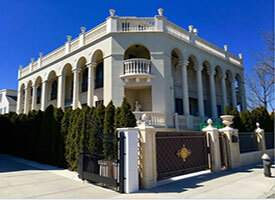 Neighboring Manhattan Beach is a high end residential area with some of Brooklyn’s most expensive real estate. Many homes are like mansions and have an ocean view. Manhattan Beach was always the more affluent side of the beach strip. Before becoming a residential area it was the beaches’ most upscale resort spot from the late 1800’s. By 1955 the resort era had ended. The residential neighborhood was then developed along with Manhattan Beach Park. It’s a large city park on the beach with lots of recreational facilities. Playgrounds, sports fields, picnic tables, a boardwalk & and the beach are open to the public. Manhattan Beach is occupied primarily by Russian Jewish folks. They’ve carved out a cozy enclave on this prime piece of ocean front Brooklyn real estate. The peninsula is surrounded by the Atlantic on one side and Sheepshead Bay on the other. It’s a scenic atmosphere with tree lined streets and water views. Homes have driveways, garages, yards, many even have pools. The neighborhood is very family friendly with private Jewish schools. 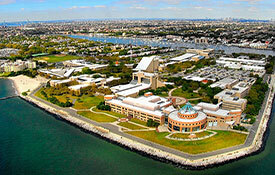 There’s also Kingsborough Community College occupying the east end of the peninsula. It’s quiet being all residential and practically no shopping. The shops and subway are close by over on Brighton Beach. The beach at Manhattan Beach Park also is generally much less crowded than Coney Island . The 2.6 mile boardwalk that stretches from Coney Islands does not extend to Manhattan Beach. However Manhattan Beach Park has it’s own walkway along the sand for .4 miles. Plus Shore blvd on the north side of the peninsula has a pedestrian path waterfront lined with benches overlooking Sheepshead Bay. Along it is the Ocean Ave Pedestrian Bridge that crosses over to Emmons Ave in Sheepshed Bay where you can also walk along the waterfront. It’s one of the nicest places to walk in Brooklyn. The path goes 1.7 miles from Pembroke St in Manhattan Beach (near the entrance to Kingsborough Community College) to E. 27 St on the other side of Sheepsheads Bay.